Video Installation Thomas Van Houtryve / Pulizer CentreThe ongoing crises in the Middle East have uprooted millions of people, yet new technology allows them to keep connected to their home communities and loved ones in unprecedented ways. The smartphone has become the essential travel companion of the 21st century refugee. Apps help migrants navigate through unfamiliar lands, stay in touch with their family and friends, contact smugglers, and even document their daily lives with selfies and posts to Instagram.How does a refugee’s life in exile differ from his or her presence online? How does their portrayal of themselves differ from how they are depicted in the Western media?Inspired by an Augmented Reality app that layers the smartphone camera view with nearby social media posts, van Houtryve reveals the digital traces of refugees that have been geo-tagged to a specific place. 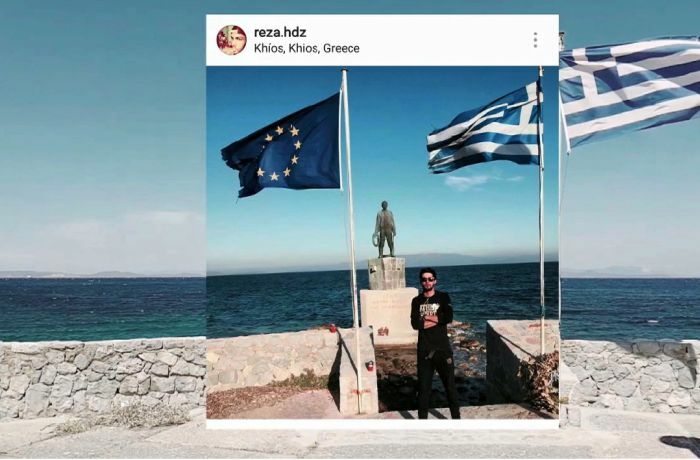 He set out on the refugee trail through Europe following the digital breadcrumbs left by these connected migrants, capturing the intersection of their online identities and places of exile.